In the early 1950s, Jennings, Missouri was a red hot White Flight destination, just a scootch outside the St. Louis city limits proper. “Newfangled” is the correct word to describe the new homes and businesses that were built at a rapid clip, designed in the modern style with the automobile in mind. 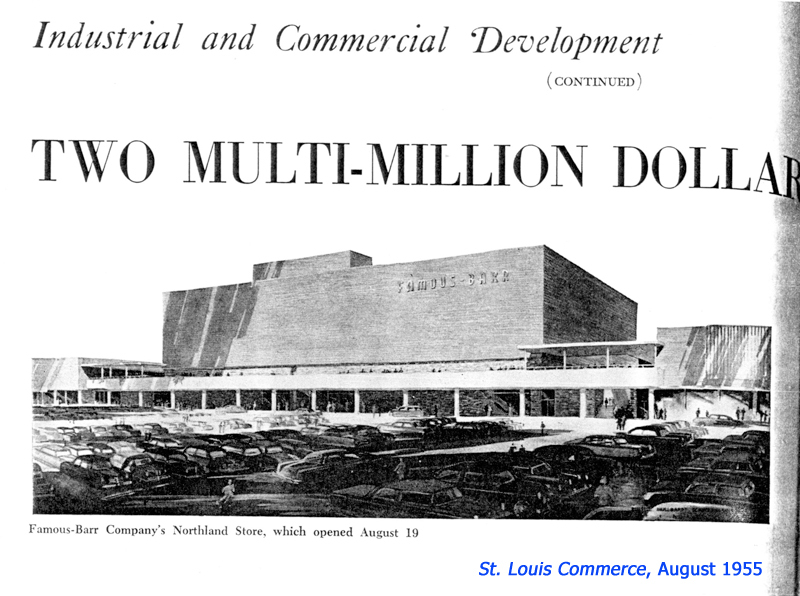 Jennings grabbed for the golden ring and gave St. Louis County its first ultra-modern retail village, Northland Shopping Center, located at the intersection of Lucas & Hunt and West Florissant. The town made the bold, jet-age move of “one-stop shopping” by selling a bucolic 64+ acre site next to the train tracks to developers G.J. 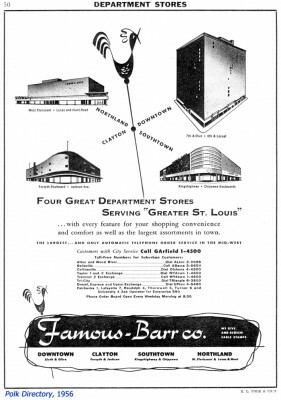 Nooney & Co.
Famous-Barr – then the leading St. Louis department store franchise – took the gamble of committing to a store in an untested suburban marketplace. Would the city people take the bus or drive their cars out to the suburbs? Would the county grow fast enough to support a store this size? The gamble paid off handsomely, and was a key component in the rapid expansion of Jennings and its neighboring towns. A shopping center of this size was an innovation, and the developer wanted architecture to match. 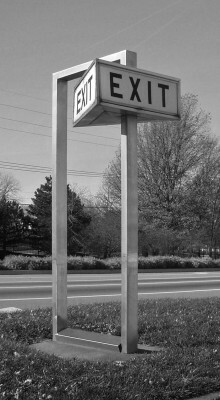 A symbol of the county’s future needed to look like the future, and there truly was a time during the 1950s when “ultra-modern” was a term used reverentially by business publications. So, the architectural firm Russell Mullgardt Schwartz & Van Hoefen embraced the concept of a groundbreaking modern facility by distilling the International Style. The architects felt this new commercial concept required the sleek, sharp angularity of this sophisticated style. The monumental brick cubes floating atop thin stainless steel columns and covered walkways bore a striking resemblance to architect Walter Gropius’ Harvard University Graduate Center (1950). The St. Louis firm expanded that idea to suit 2 levels of outdoor shopping by adding the latest in space age materials, textures and colors. Aesthetically, it was a grand piece, a concept writ large. The car and the walker were both large in the architects’ minds, for the driver and the pedestrian shared the ground back then (it was only when the car took over completely that shopping centers became so boring and ugly). 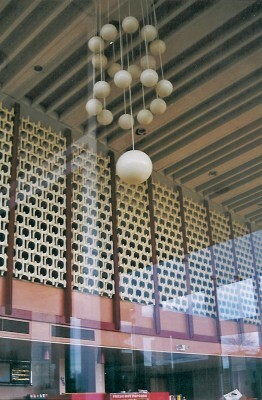 But at the time of its construction, tactile views and sensations still mattered. What will a person see as they descend the stair to the lower level? Can we entice them into a lingerie shop on their way to buy new school shoes? The views from every angle were precisely considered…stainless, modular, weighty; that aqua and green, that metal atop sandstone, those plastic screens all bubbly white and tic-tac-toe like, those slabs of stainless steel jutting out from the brick bulk cube… geometric and breathtaking, creating a comfortable and exciting shopping experience. 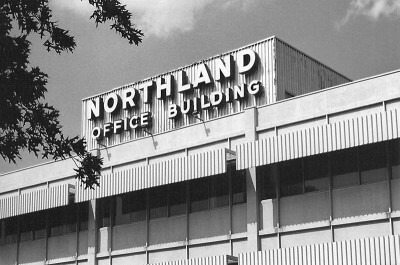 From the grand opening in August of 1955, Northland was an immediate and huge success. In short order, outlot buildings were added to the complex, including an office building (designed by Welton Beckett), a grocery store (Bettendorf Rapps) and a post office. 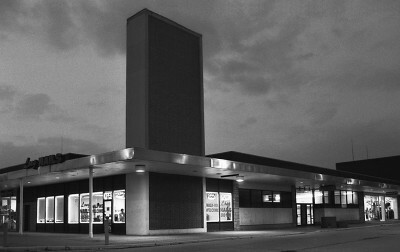 A bowling alley was added onto the northeast lower level, while a bank capped off the west end, close to West Florissant. 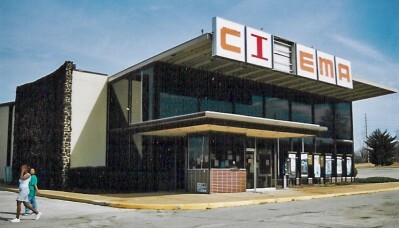 A cinema was built in 1967. Northland predicted, embodied and propelled the new car-centric suburban lifestyle, but it was easy to get to on foot, and became a major bus hub. Its central location at the crossroads of city and county made it a natural gathering place, where people of all ages, incomes and races filled the stores, the parking lots and the outdoor terraces at all hours of the day. It had all the amenities of a small village; whatever you needed could be found within the triangle of Northland. Its aesthetic statement bled into the look of the developing commercial districts that strung out behind it to the west. Its financial success enabled the St. Louis County residential and commercial population to thrive. Northland easily maintained its retail and social predominance among the throngs of imitators it spawned. A 1979 St. Louis magazine article listed all of its strengths and attributes, 23 years after it was built. But around 1994 Famous-Barr, wanting to concentrate on deep county mall stores, pulled out of Northland, and it proved a fatal blow. No new anchor store took over the vacant 337,00 s.f. space, and without a solid draw, business to the smaller stores diminished. National chain retailers were replaced with lesser known and locally owned businesses, and vacancy rates and crime escalated. 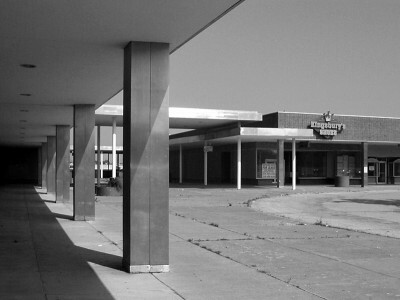 With its reputation marred and the buildings suffering from deep neglect, the Sansone Group – who specialize in redeveloping older shopping plazas – determined that the rising income level of the Near North County St. Louis was enough to warrant a re-think of Northland, which meant complete demolition of everything on the property. 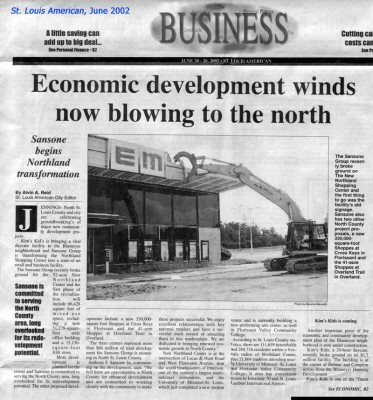 In July 2002 the Northland Cinema was demolished. The only commemoration was a photograph on the front page of the St. Louis American newspaper. A government center now stands on the spot. In 2004, they built a new home for the Aldi’s grocery store, which then left the original grocery story building vacant. Despite willful neglect, Northland was in surprisingly good structural shape. Considering that it had been purposely left to rot, the stainless steel colonnades were rust-free and straight, the brick and stone facades still crisp despite years of water damage. It was built at the tail end of an era when permanence was a virtue. The place had been designed and built to last a long time because no one then could have predicted that heightened obsolescence would become the religion of the short attention span. 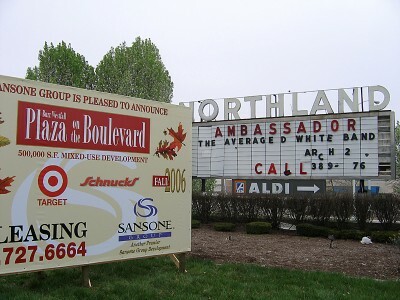 A May 30th, 2004 St. Louis Post-Dispatch article said the Northland Shopping Center would be demolished to become the $50 million Buzz Westfall Plaza on the Boulevard, with Target as its major tenant, and a Schnuck’s grocery store would be returning to a spot it had previously abandoned. The article said “the mall suffers from an antiquated design.” It was an open-air plaza, a multi-level variation on the strip mall, with 5 standalone buildings along the edges of the site. The developers described their new plans as “a 270,000-square-foot shopping strip…will feature five standalone buildings around the site’s perimeter for restaurants and other retailers.” The irony didn’t ease the sting. 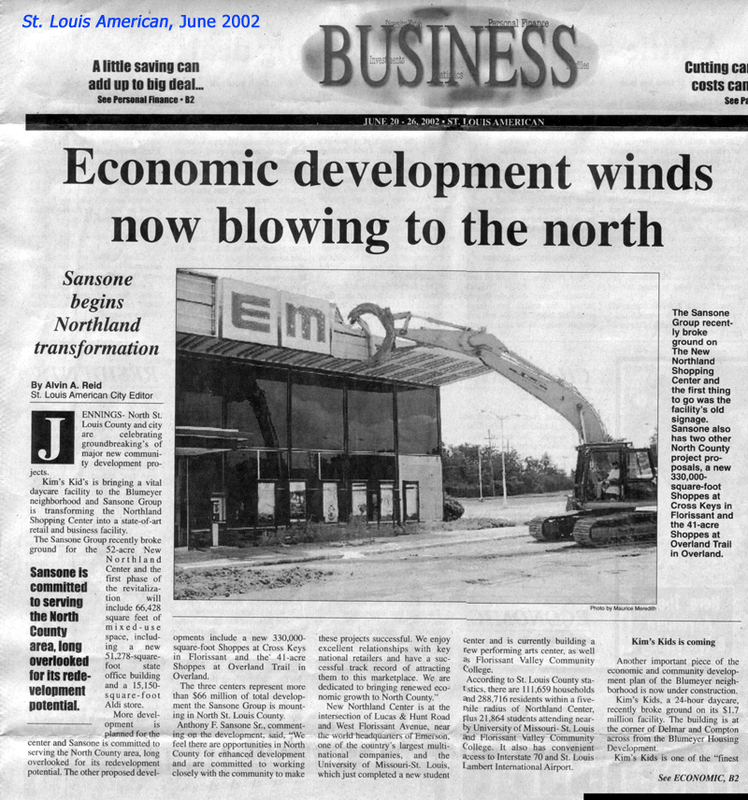 As Northland demolition began in April 2005, articles about the slow death of enclosed shopping malls were becoming more frequent, accompanied by predictions that open-air, village-like shopping destinations were the coming retail trend. Again with the stinging irony! Couple that emerging retail trend with a full-blown appreciation for retro mid-century modern style, and the story becomes even more bittersweet. 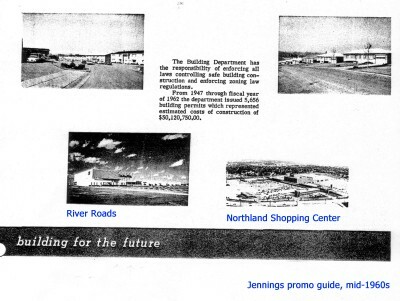 When the headache ball took its first swing at the former Famous-Barr building, Northland was 4 months away from its 50th birthday, which would have qualified it for Historic Tax Credits to refurbish it into a genuine retro open-air shopping destination! 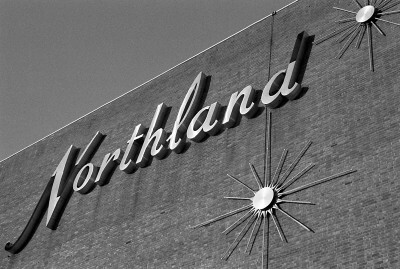 Saving a shopping center is practically unheard of, but the architectural and historical aspects of Northland made it a special case. I still imagine how cool a multi-story Target inside the Famous-Barr building would have been, how the properly-marketed genuine retro buzz would have made it a truly one-of-a-kind shopping destination, and how trailblazing and “green” the resurgence of a retail legend would have been. Northland originally blazed a trail to the future, and it could be have blazed a trail for innovative retail ideas and modern preservation. 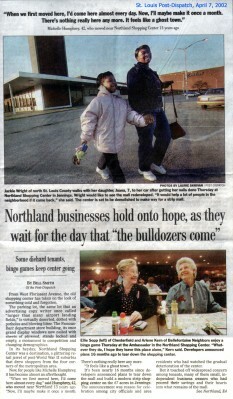 But that’s just crazy talk, and by November 2005, Northland Shopping Center was dust.